Carolyn is a Registered Provider of Psychological Services with Medicare, DVA and all the major Health Funds. Here are some common questions about seeing a Psychologist. No, you don’t need a referral to see a Psychologist. Do I have to have a mental disorder to see a psychologist? No, the worried well are all welcome. Which age groups does Carolyn Rogers see? Carolyn only treats adults from the age of 18, though she will see young females who are in their 18th year. Psychologists generally don’t treat conditions or age groups outside their areas of expertise. 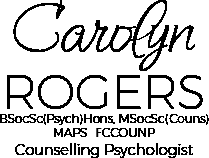 If, after contacting Carolyn, she determines that she is unable to assist you then she will help you to find a suitably qualified Psychologist. Can I get a rebate for seeing a psychologist? Yes, if you have Health Insurance with Extras Cover that includes Psychology, however there will be an annual limit. Please check with your Health Fund for more information. A HICAPS terminal is available to process rebates immediately for members in participating Health Funds. You will need a Mental Health Treatment Plan prepared by your G.P. and a referral, or just a referral letter from your Psychiatrist. Medicare offers rebates for up to ten (10) sessions per calendar year to people with an assessed mental health disorder which is being managed by their G.P. Ask your Doctor for more information about this. A Medicare Online terminal is available to process Medicare claims immediately after each session. The Medicare rebate is currently $84.80 per session of 50 minutes or more. Your Health Fund cannot be used to cover the gap but it does go towards your Safety Net. The recommended fee currently set down by our professional organization The Australian Psychological Society (APS) is $238 per 45 – 60 minute session. Carolyn Rogers’ fees range from $125 to $160 per 60-minute session depending on the client’s circumstances. She does not Bulk Bill. The Gap between Carolyn’s full fee and the Medicare rebate represents an investment in your mental health and well-being of $752 for 10 sessions per calendar year, and even less if you have reached your Safety Net as the Medicare rebate increases.